If you are a contractor looking to complete a cellar door installation for a new construction project, don't hesitate to contact our office for quotes and availability! Get a FREE New Construction Quote Today! Clear access for the boom truck (101″ wide, even surface). 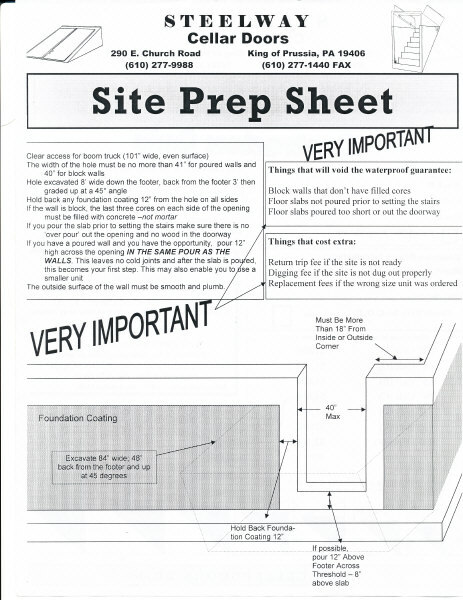 Make sure that the width of the hole is no more than 41″ for poured walls and 41″ for block walls. The hole should be excavated 8′ wide down the footer, back from the footer 3′, then graded up at a 45° angle. If you're working with a block wall, the last three cores on each side of the opening must be filled with concrete instead of mortar. If you pour the slab before setting the stairs, make sure there is no "over pour" out of the opening and that there is no wood in the doorway. 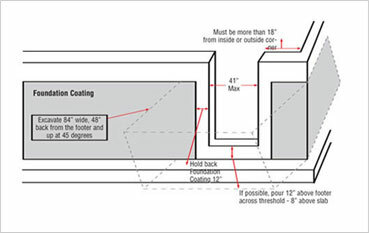 If you have a poured wall and you have the opportunity, pour 12″ high across the opening in the same pour as the walls. This will ensure that there are no cold joints. After the slab is poured, this will become your first step. Make sure that the outside surface of the wall is smooth and plumb. Block walls that don't have filled cores. Floor slabs that were not poured prior to setting the stairs. Floor slabs that were poured too short or out of the doorway. Return trip fee if the site is not ready. Digging fee if the site is not dug out properly. Replacement fees if the wrong size unit was ordered. We are proud to provide new construction services for contractors looking to install new basement doors and entranceways. Contact us today to find out more and receive a cost estimate in Wayne, Norristown, King of Prussia, or nearby!